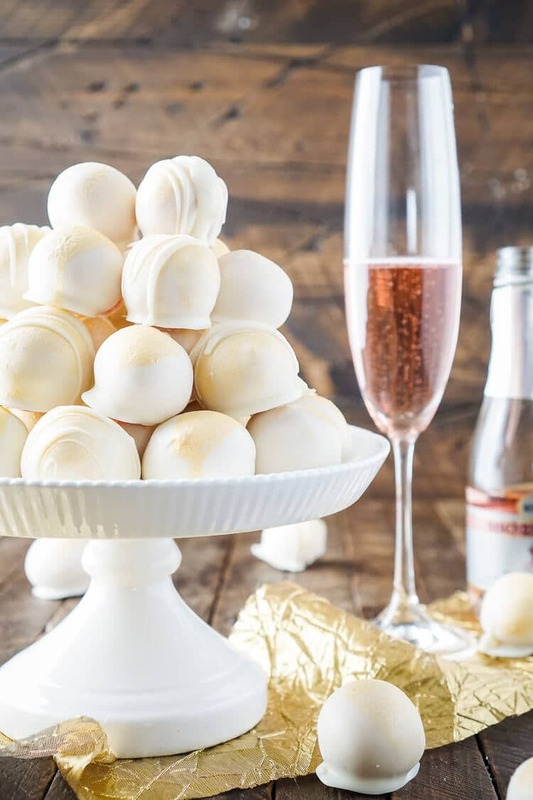 These Strawberries & Champagne Cake Balls are perfect for New Year’s Eve, Valentine’s Day, Bridal Showers and so much more! 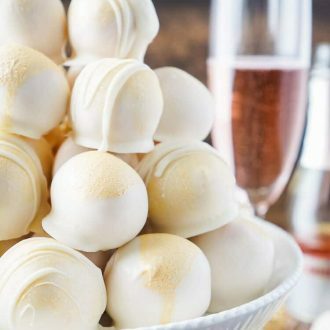 These Champagne Cake Balls are such a fun treat to serve for NYE, bridal showers, and more! Each year I always try to make a new New Year’s Eve inspired dessert for you guys and I always end up making cupcakes! 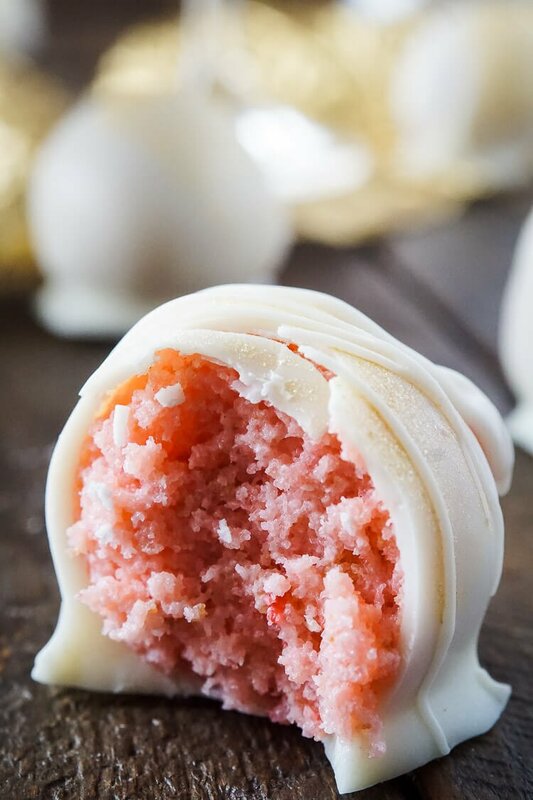 See White Chocolate Raspberry Champagne Cupcakes and Coconut Champagne Cupcakes, but this year I’m sharing cake balls! 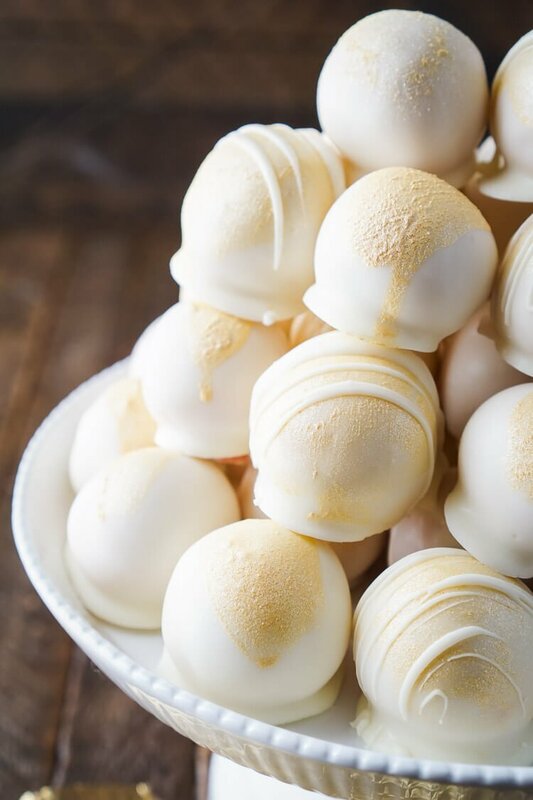 Are cake balls a thing of the past? I’m not really sure, but I do know that they’re still pretty tasty! These ones taste like fruity pebbles! And seriously, who doesn’t love fruit pebbles! And yes, they’re pretty sweet. 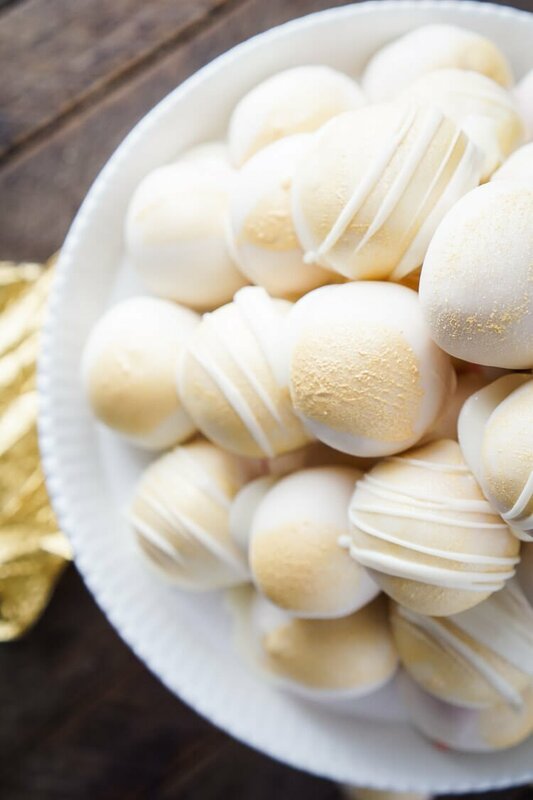 With strawberries, champagne, and white chocolate, how could they not be? These balls are actually quite easy and fun to make, so don’t let the 5 hour prep time scare you since about 4 1/2 hours of it is inactive time waiting for them to chill, freeze, and harden. The rest is pretty much. baking, rolling, dipping, and painting. Yup, you read that right… PAINTING! 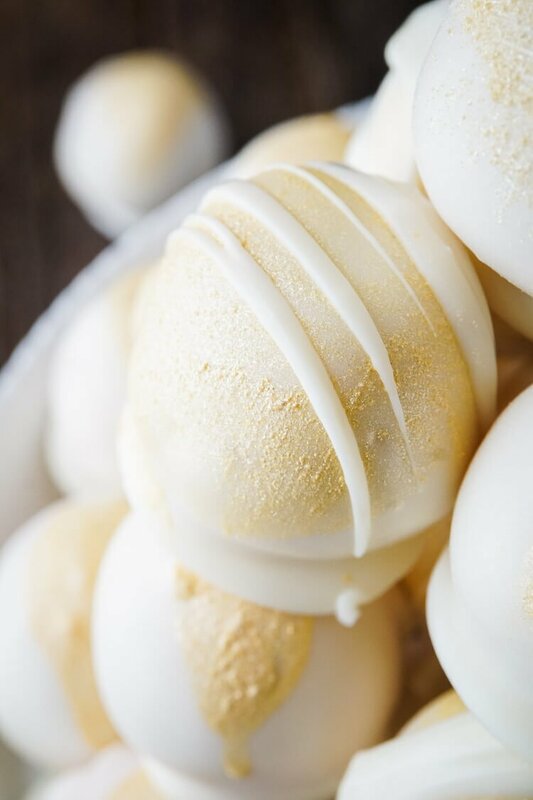 In order to glam these up a bit, we’re going to use Wilton gold pearl dust mixed with some lemon extract for an edible gold paint to brush these babies up with! These make such a fun little treat and the recipe makes a ton, which is great if you’re throwing a party! Make them for New Year’s Eve, Valentine’s Day, Bridal Showers, Baby Showers… the list goes on! 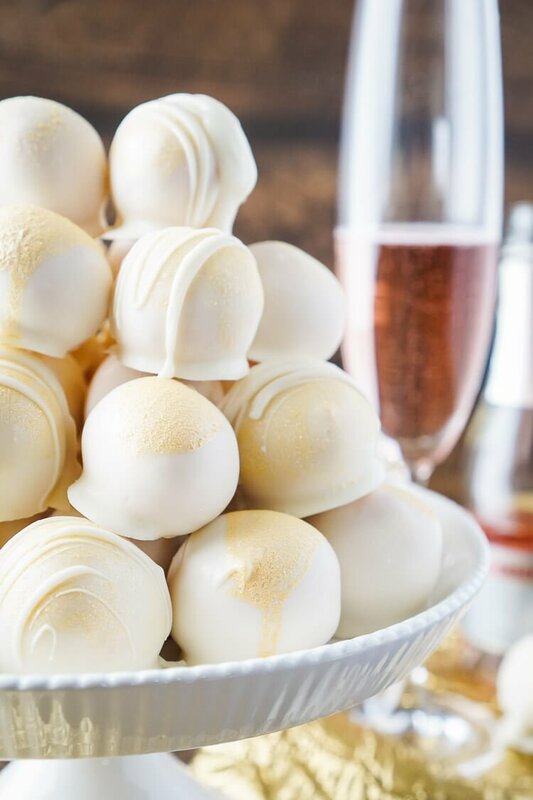 These Strawberries &Champagne Cake Balls are perfect for a New Year's Eve party, Valentine's Day, Bridal Showers and so much more! They make an easy dessert that tastes like fruity pebbles! Spray a 9x13-inch baking pan with nonstick cooking spray. Set aside. In a large bowl or stand mixer fitted with a whisk attachment, beat cake mix, champagne, oil, and egg at medium speed until smooth. Pour batter into prepared pan. Bake according to package directions or about 30-35 minutes until toothpick comes clean. Remove from oven and allow the cake to cool, then slice into squares. Crumble the squares of cake into a large bowl or stand mixer bowl with your hands. Add the frosting to the cake crumbles and mix with a whisk attachment on a stand mixer or hand mixer until evenly combined. Cover and place the bowl in the refrigerator for at least 2 hours or overnight. Line a baking tray with wax paper. Form small round balls by rolling a rounded tablespoons worth of mixture between your palms. Place the balls on the prepared wax paper lined baking sheet. When balls are complete, place the baking tray in the refrigerator for 1 to 2 hours. 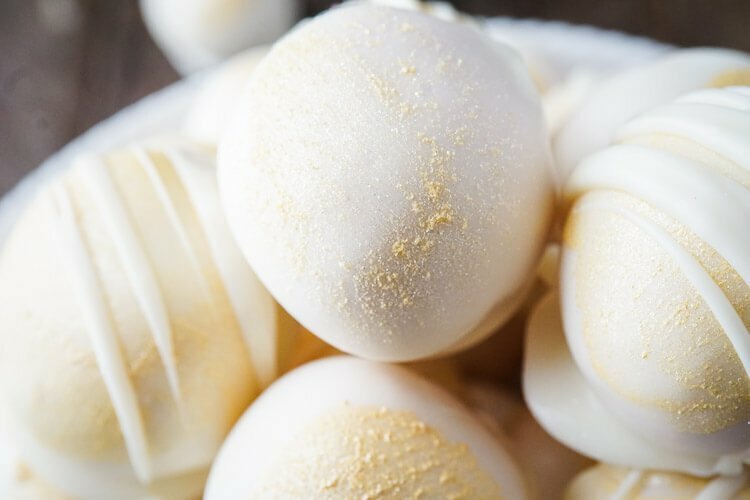 Melt the white chocolate in a microwave-safe bowl in the microwave on 30-second intervals, stirring between each, until smooth. Stir in the vegetable oil. Remove the balls from the freezer. Drop balls one at a time into the melted chocolate, use a fork to scoop them out, wiping any excess chocolate on the rim of the bowl before transferring back to the wax lined baking sheet. Let them harden completely. Mix the pearl dust and lemon extract in a tiny prep bowl and paint the balls. Get creative and have fun with it, some of mine are painted all over and have additional chocolate drizzled on them. Others just have a brush stroke while others have a dusting of the pearl dust. You can also add sprinkles, but make sure to do so before the chocolate coating hardens so they'll stick. This recipe was updated 12/29/16 to reflect suggestions for easier dipping from reader and cake ball pro, Colleen. The original recipe did not include vegetable oil and called for butting the balls in the freezer instead of the refrigerator. Recipe adapted from The Seasoned Mom. Non-alcoholic version: replace champagne with water or skim milk. Delicious!!! Every body loved them….